We recently posted a blog providing tips to help speed up the inventory counting process. Some of these tips were general and apply to all bars, regardless of the inventory system they use. Others were more specific to using Bar-i’s software. One item that makes Bar-i’s inventory system unique is the mapping system we use for counting inventory. 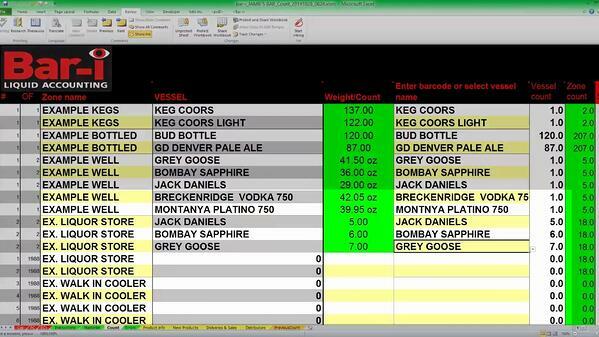 This mapping system syncs up with the order of products on our inventory spreadsheets to provide a seamless counting process. When evaluating our inventory system, it’s important for you to understand some basic principles associated with the way our spreadsheets are organized. We’ve found that this organizational structure is crucial to our ability to count with the highest levels of speed and accuracy. Each time a line is used to record the weight of a partial bottle or the total number of full bottles on-hand, it represents one product position on our spreadsheet. Therefore, you will typically have two times as many product positions on our spreadsheet as you have products served at your bar. In some instances, this ratio may be slightly larger than 2:1 if there are multiple bars in your establishment. In these situations, the products served at each bar will have their own product position and there will be an additional product position for the items in your storage room. On average, most of our bars carry approximately 200 products, which means they often require 400-600 product positions in our spreadsheet. In general, most of our bars have under 800 product positions; however, some of our largest clients have almost 2,000 product positions. This would represent the upper limit of what can realistically be counted in one day. When using Bar-i’s software, you can reasonably expect to count 300 lines per hour. Therefore, if you have 400-800 product positions to count, you should be able to complete the counting process in 2-3 hours. If you’re spending more than this amount of time counting, you should look for ways to speed up the process.